Difference between revisions of "Terence Powderly"
| caption = Terence V. Powderly (1849-1924) led the Knights of Labor, a powerful advocate for the eight-hour day in the 1870s and early 1880s. Under Powderly's leadership, the union discouraged the use of strikes and advocated restructuring society along cooperative lines. advocated restructuring society along cooperative lines. 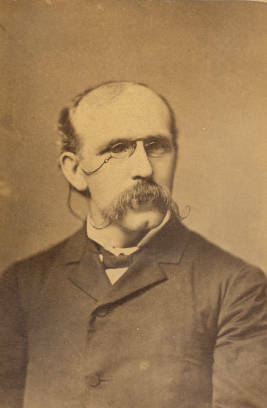 Terence Powderly was born in 1849, in Carbondale, Pennsylvania. While still a teenager, Powderly became an apprentice in a machine shop. Unhappy with working conditions in his chosen industry, Powderly joined the Machinists and Blacksmiths National Union in 1871. Within one year, Powderly had become this union's president. During the late nineteenth century, Powderly emerged as one of the leading advocates for better working conditions for American workers. He joined the Knights of Labor, another union, in 1874. In 1879, Powderly attained the highest leadership office, Grand Master Workman, in the Knights of Labor. Under Powderly's leadership, the Knights of Labor's membership rose to 700,000 laborers. Powderly generally opposed strikes, preferring boycotts and peaceful negotiations to attain an eight-hour work day, better wages, and improved working conditions in general. Other leaders within the Knights of Labor preferred utilizing strikes. After the Haymarket Square Riot in Chicago, Illinois, in 1886, the Knights of Labor declined as an effective organization. Powderly resigned as grand master workman in 1893. Powderly's leadership style caused much dissatisfaction among the Knights of Labor's members, especially among those members who favored strikes. In 1886, Samuel Gompers broke with the Knights of Labor. He called for an organization meeting to occur in Columbus, Ohio in December 1886. At this meeting, Gompers and his supporters created a new union, the American Federation of Labor. This organization quickly emerged as one of the United States' most powerful unions during the 1890s. Powderly held several elected and appointed positions during his life. Residents of Scranton, Pennsylvania, elected Powderly mayor of their community in 1878, 1880, and 1882. Upon resigning from the Knights of Labor, Powderly studied law, passing the Pennsylvania bar exam in 1894. He served as the United States Commissioner General of Immigration from 1897 to 1902 and as Chief of the Division of Information in the U.S. Bureau of Immigration from 1907 to 1921. Powderly died in 1924.